There are 4 major fibers used to make residential carpet: nylon, polyester, olefin and wool. Nylon is by far the most widely used man-made fiber in tufted residential carpet. It is very durable and accepts dye well, allowing for a wide range of colors and styles at reasonable prices. Polyester is sometimes used in carpet. It is a very soft fiber and should be used only in low traffic areas as it does not have much resilience, or ‘spring-back’. Olefin (polypropylene) is also a man-made fiber well-suited for indoor/outdoor carpets and in tight, loop-piles it is used in commercial settings. Wool is the oldest and most expensive fiber used to make carpet. It is a natural fiber derived from the fleece of sheep and is found in fine oriental rugs and also very expensive woven rugs. Durability depends on three factors: fiber type, yarn twist, and the pile density. Choosing a carpet wisely means balancing all three factors. Look for a strong, resilient carpet fiber like nylon. Nylon is the strongest, most resilient type of carpet made. 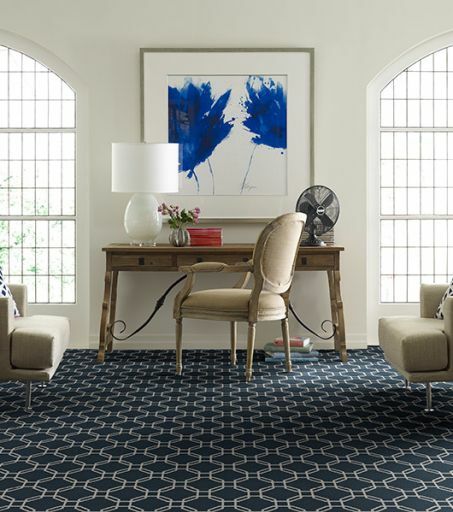 Carpets with a tight yarn twist will resist changes in appearance and texture over time. The density of the pile is important for proper resiliency and appearance. Twist tips: Look to see that the cut ends of the carpet file neat and tight. Unless, of course, you are looking at a loop pile carpet. The thicker the better: Bend a carpet sample into a ‘U’ shape and see how much of the carpet backing you can see. The less backing visible, the denser the carpet. There will be four prominent considerations in your mind when picking your carpet – your budget, the color you need, the type carpet you want, and a question if the carpet you select will last. Our sales professionals are knowledgeable about carpet and will help guide you to selections that meet your requirements. Give them as much information as possible. For example: Tell about your family including how many people and ages, which will enable them to determine the best carpet for your traffic patterns. Explain which rooms you wish to carpet and the approximate sizes. If possible, bring a fabric swatch to help in color selection. Tweeds, pebbled textures, and patterns are good choices where spills and soiling are likely. Light-colored carpets show soil, like dirt, sand and clay more than dark colors. Dark colors show lint easier. You will see much confusing information about carpet. Ultimately what should be important to you are the written warranties covering the carpet you purchase, since this is the manufacturer’s promise and commitment to you. Many manufacturers give each product line a grading based on the warranties and how they know the carpet will perform. These grades are NOT based on price; they are derived from the many variables involved in manufacturing carpet. It is your written assurance that the carpet will last and retain its appearance. This allows you to select your new carpeting based on color and aesthetics. Padding is an important part of your carpet system. Our trained professional staff will recommend the right type of pad for your particular carpet and installation. Carpet is a beautiful addition to your home. We hope that a few of your questions have been answered and that you enjoy your new carpet for many years to come.